Just when I thought that the Big Fundamental is through in building his illustrious NBA Career from bottom-up after winning his 5th NBA Championship at the expense of the same team that reigned on them last year, Tim Duncan declared today that he will stay with the Spurs for the 2014-2015 NBA Season. The 38-year old Duncan decided to opt in with San Antonio for next season. His decision will of course affect the decision making of his other veteran teammates like Manu Ginobili and Tony Parker. 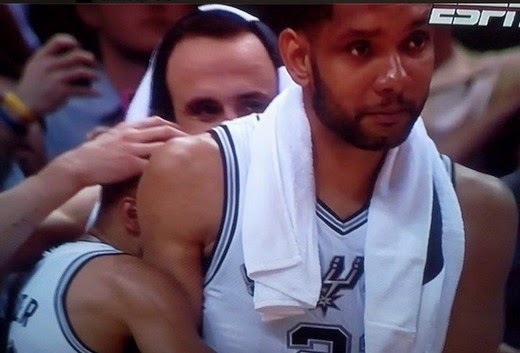 I can foresee that the core of the Spurs will still be in tact as long as their anchor Tim Duncan is there. Count on the Spurs' Big Three. They will be more than ready to unleash a title defense next season. At 38, Tim Duncan averaged 16.3 points and 9.1 rebounds in the playoffs en route to his fifth NBA title. He is set to receive just over 10 million USD next year after opting in.